The thrill and excitement of the NHL's Stanley Cup returns with particular interest to Nashvillians since our hometown team, the Nashville Predators, have made it into the playoffs. If you don't have tickets to the home games at Bridgestone Arena, don't sweat it. Your family can catch the excitement with thousands of other hockey fans during the Preds Party in the Park. Nashville Convention & Visitors Corp hosts and produces the free event taking place at Music City Walk of Fame Park, located across Fifth Avenue South from Bridgestone Arena. Each party ramps up two hours prior to game time with a DJ on site providing entertainment before the puck drops. A large video feed will show the game feed. Food trucks and hot dog vendors will be on site, and water, soda and beer will be on sale. You can bring blankets and chairs (see below for full list of house rules). "Even if you don't have a ticket to be inside Bridgestone Arena during home playoff games, you can still share in the Smashville spirit with other Preds fans during the viewing parties," says Butch Spyridon, president/CEO of the Nashville Convention & Visitors Corp. "The excitement and energy of the viewing parties have been embraced by Nashville and Preds fans over the couple of years, and we can't wait for the tradition to continue this year," he adds. 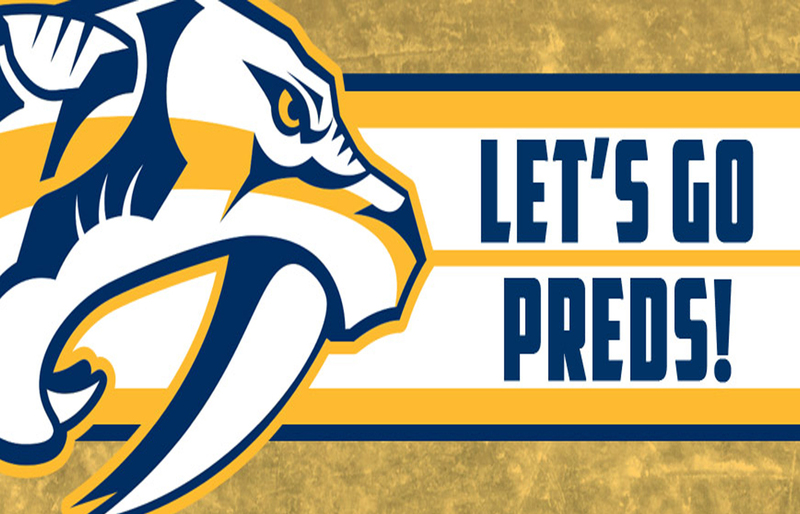 Game 1: Wednesday, April 10 (against Dallas Stars at Bridgestone Arena). Party starts at 6:30 p.m.; game starts at 8:30 p.m.
Game 2: Saturday, April 13 (against Dallas Stars at Bridgestone Arena). Party starts at 3 p.m.; game starts at 5 p.m.
All personal items are subject to search. • Unauthorized vending, sales, sampling, solicitation or distribution of materials, including handbills, flyers, stickers, beach balls, giveaways, etc. • Unauthorized personal transport devices, including bicycles, roller blades, skateboards, Segways, golf carts, mopeds, scooters, electric scooters or any personal motorized vehicles other than wheelchairs or ADA devices. • Performances or demonstrations of any type outside of the designated "Freedom of Expression Zone"
Find updated info at visitmusiccity.com/predsparties throughout the playoff run. If you're participating on social media, use #StandWithUs.